Sandwiched in between Ontario’s Algonquin Park and Quebec’s Réserve Faunique La Vérendrye is the upper Ottawa valley, the core of the traditional homeland of the indigenous people known to us as the Algonquins. An early source of beaver pelts for the fur trade, from the early 1800s onwards it became a region associated with the lumber industry. In time hunting and fishing camps were added to the Canadian Shield landscape. In the past generation or two, it has also attracted other visitors, including those with canoes strapped on top of their vehicles and with back seats filled with gear, canoe packs, and enough food for a week or two of downriver adventure. Hap Wilson’s 1993 guide-book Rivers of the Upper Ottawa Valley: Myth, Magic, and Adventure (and a 2004 reprint) was my introduction to the various possible canoe trips in the region. As well as information about some rivers on the Ontario side, the book has a chapter on each of the three great canoe tripping rivers that tumble down to the Ottawa River from the boreal Shield on the Quebec side – the Dumoine, the Noire, and the Coulonge. The book has sat on my bookshelf for over a decade waiting for my full attention! Sometimes called “The Three Sisters”, these three rivers have attracted paddlers keen on whitewater play and the feel of wilderness over the past few decades. Since the mid-1980’s the rivers are no longer used for logging runs. Looking at the Google satellite images of the region and you can see that logging still continues with the rough logging roads taking the place of the fast-moving waters of the springtime rivers. These same roads also give paddlers with shuttle access to various points on the river of their choice. This August (2016) we finally got to the Pontiac region on the Quebec side. Having to choose one, we settled on the Coulonge. The length of the river was for us a major attraction. Of the Three Sisters, it is the longest. Our 271-kilometer paddle started in La Vérendrye Park (officially named La Réserve Faunique La Vérendrye) where Highway 117 passes by Lac Larouche. Lac au Barrage, the official headwaters of the river system, is about ten kilometers to the west of the put-in at the boat launch on Lac Larouche. La Vérendrye Road #28 takes you from Hwy 117 to a put-in on Lac Au Barrage if you would rather start right at the headwaters. Another positive feature is the 260-meter (850 feet) drop that the Coulonge makes from its headwaters in Lac Au Barrage to the Grand Chute just before Fort Coulonge on the Ottawa River. It has extensive sections of fast water and swifts (estimated at 52 kilometers by Wilson) and 69 runnable rapids (70% of which Wilson grades as Class I). Given that the more technical rapids are easy to portage around, the Coulonge makes for an excellent river to introduce “newbies” to the adrenaline-pumping aspect of canoe tripping. Yet one more “plus” was this – the portages themselves are mostly around ledge-type rapids and, as a result, they tend to be short. Again, Wilson’s estimate for the total portage distance, if all 19 are done, is a mere 3.5 kilometers. This makes the Coulonge a relative piece of cake compared to, for example, the 16 kilometers of portage trail (and 32 kilometers of actual walking!) we had to deal with on our 350-kilometer trip around the perimeter of Wabakimi Provincial Park. 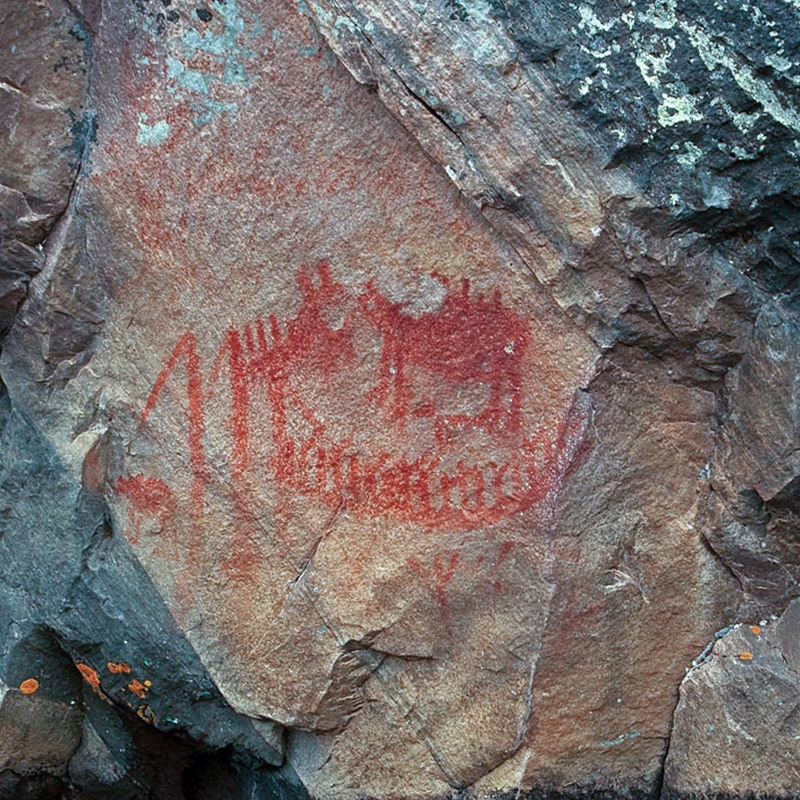 Of interest to us since our immersion in the world of Canadian Shield pictographs some three years ago is this – the region is the traditional heartland of the Anishinaabe people known to us as the Algonquins. With their great river as the core – they called it the Kitchi Sibi (or Sipi) but we know it as the Ottawa – their traditional territories reached inland on the various tributaries that make up the Kitchi Sibi watershed. The Coulonge is right in the center of that world. from Bonita Lawrence. Fractured Homeland. UBC Press. 2012. They were among the first indigenous peoples whom Champlain met in his exploration of the lands up the St. Laurence River from Quebec. 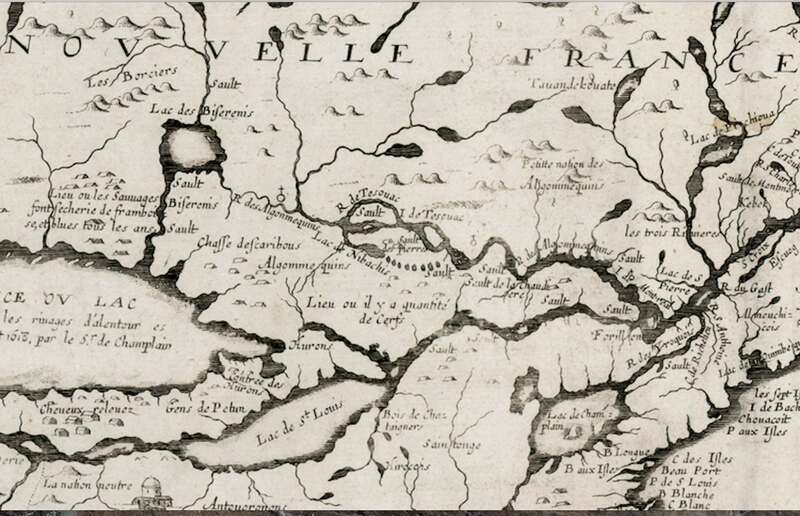 In a map from 1634 Champlain labelled the great river which runs through their lands La Rivière des Algoumequins and noted their presence on both sides of this river. Before contact with the Europeans in the early 1600s, this hunter/gatherer culture may have numbered some 3000 to 6000. (Estimates seem to vary wildly.) Apparently, the terms Algoumequins or Algonquins derive from what Champlain heard when he asked his Micmac hosts who they were. The term translates as “they are our allies” in their Algonquian language. The Algonquins are associated with such sites as Oiseau Rock, the dramatic pictograph site on the Ottawa River on the Quebec side across from Deep River. The Mazinaw Rock pictograph site on the headwaters of the Little Mississippi River on Mazinaw Lake in what is now Bon Echo Park is yet another significant Algonquin cultural site. The petroglyph site on the north shore of Stoney Lake near Peterborough, Ontario is a third site which drew generations of Algonquin shamans and vision questers before the arrival of the French in the early 1600s. 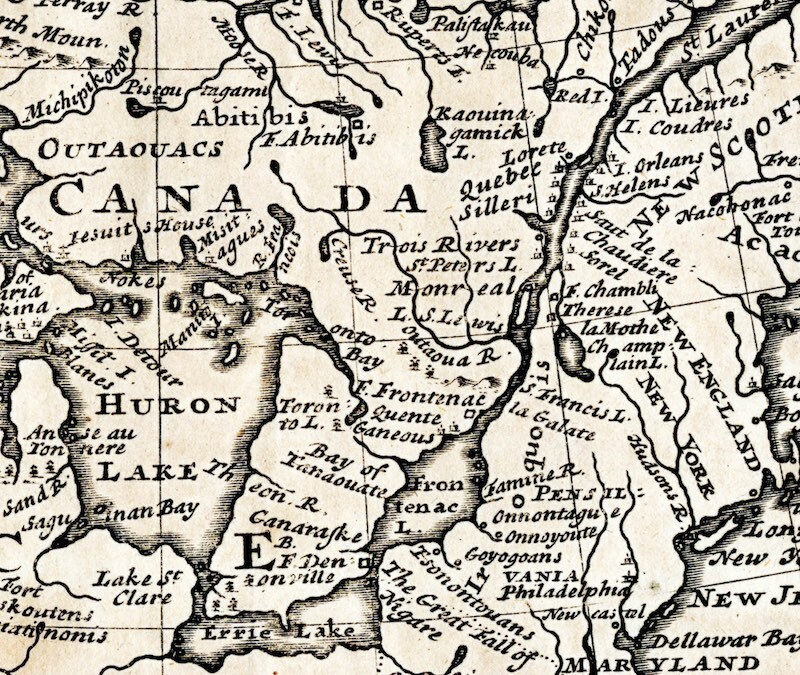 The river would see its name changed perhaps fifty years after Champlain’s time and the decimation of the various Algonquin bands in the war against the Iroquois and by smallpox. 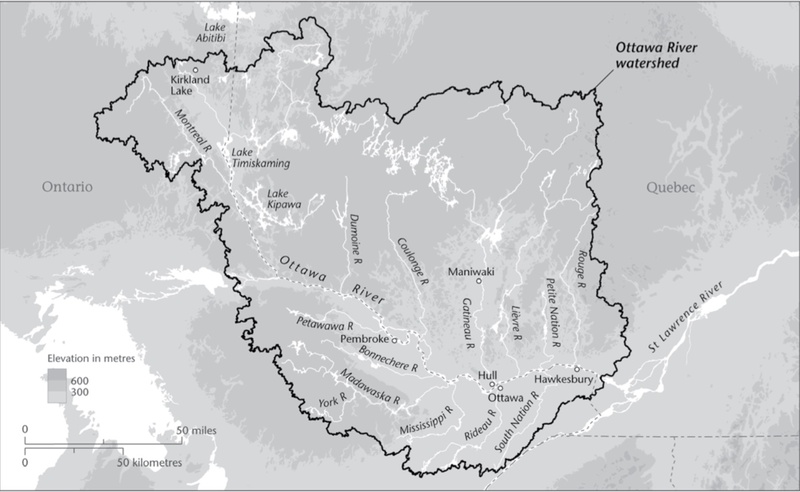 With the loss of an Algonquin presence, the river’s use by the Odawa fur traders from further west to access Montreal would mean the river would come to be associated with them. Admittedly our trip down the Coulonge did leave us wondering about the extent of the Algonquin presence. There are very few Anishinaabe echoes to be heard along the river in the form of names of rapids and falls and other noteworthy landmarks. It may be yet another example of the ethnic scrubbing of any Anishinaabe place names from the maps created by the Canadian Shield’s new masters. However, even this Anishinaabe website The Land That Talks (see here), while providing names for locations elsewhere in the upper Ottawa Valley, leaves the Coulonge untouched. My brother and I were both born In Noranda on the west shore of Lake Osisko at what was then the Hôpital Youville. Just two short portages away is the Kinojevis River; a tributary of the Ottawa which flows south to merge with the great river. Another one hundred kilometers west and the Ottawa reaches Notre Dame du Nord at the north end of Lac Temiskaming. Mattawa is still a few days’ paddle to the south. Somehow travelling up Highway 117 to our put-in was like going home – while we were not quite up in the Abitibi the topography was very familiar. 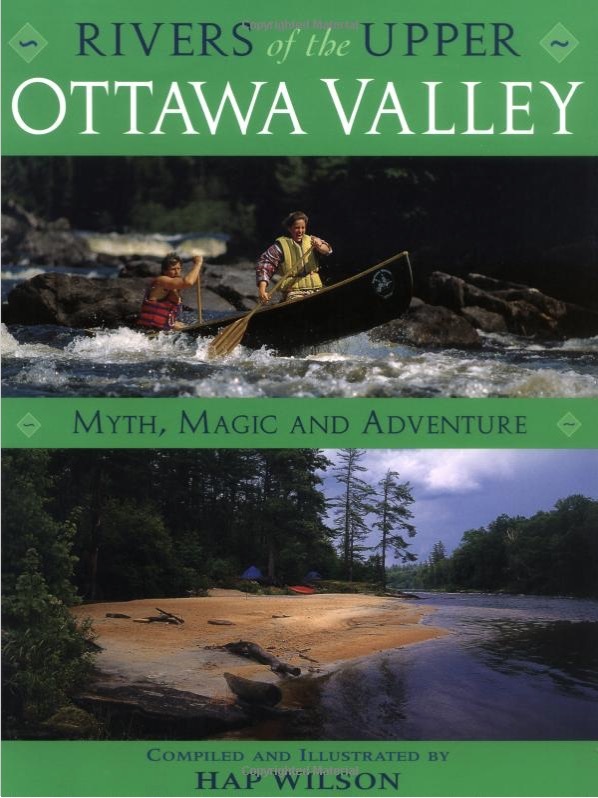 The obvious starting point for any canoe tripper planning to spend some time on the Coulonge River system is Hap Wilson’s Rivers Of The Upper Ottawa Valley: Myth, Magic and Adventure. Like his tripping guide-books to the Missinaibi, the Temagami area, and Manitoba, it has remained the definitive and most reliable single source of information and advice since it was published in 1993. Aside from a few obvious changes to the appearance of the book, I present Rivers of the Upper Ottawa Valley as it originally appeared when it was released a decade ago. We take it as a good sign when a canoe tripping guide-book is still accurate and relevant a quarter century later. If nothing else, we see our series of posts as a visual accompaniment for the Wilson maps. These posts may provide potential canoe trippers with a better idea of what they will see when they set off on their own adventure on the Quebec side of the upper Ottawa Valley. It is definitely a journey worth making. The 1:50,000 Canadian Federal Government topo maps are available for free download if you want to print them – or parts of them – yourself. The maps can be accessed at this government site – here. All the maps for this trip are in folder 031 – open it and use the specific letters and numbers for each map to get what you want. Even better – click on the specific map below for the direct link! At $20. for a sheet, the cost of having professionally produced copies of the maps quickly becomes very expensive! It is also unnecessary. We just printed our own copies of those parts of the topo maps relevant to us. Kept inside a waterproof map case they served as our main map set in the canoe. We also had a Garmin eTrex 20 with a copy of the Garmin Topo Canada (version 4) map set installed. We used it to create a daily track of our route, to record points of interest and potential campsites, and other details. It also provides another perspective on those occasions – there may be one or two! – when you might be unsure about your exact location. Since my Garmin Oregon 450 was out of commission for the trip (the rubber on/off switch broke through and needed to be replaced) I ended up taking my iPhone 4S for its GPS capability. 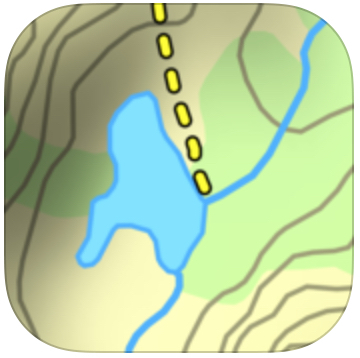 I had already downloaded the David Crawshay ios app Topo Maps Canada along with the various 1:50000 topos. You can find the app here at the iTunes site.) There is a German-developed Android app which seems to do the same thing. See here for details. While battery concerns would limit iPhone use, it works nicely along with the paper maps if you only want the occasional confirmation of your location and do not want or need all the other stuff that a dedicated GPS device offers. Figuring out how to get back to your vehicle(s) at the end of a down-the-river trip is often the biggest headache. Recent solutions for some of our canoe trips have included: a $2400. de Havilland Beaver pick-up on Lake Winnipeg to get us back to Red Lake; and a trip down the Steel River system which amazingly ends up close to where it starts. For the Coulonge, our friend Cyril in Ottawa made it easy. He rode up with us to the put-in point at Lac Larouche off Highway 117 about 60 kilometers NW of Le Domaine and then drove the car back to Ottawa. Then we spent the next two weeks paddling back to Ottawa with the knowledge that he was okay with coming to get us at Fort Coulonge or Renfrew or Arnprior if things didn’t work out. Click on the More options prompt in the top left hand box to enter a full screen view of the Google map. The route indicated goes right to Lac Au Barrage, the actual headwaters of the Coulonge River system. We started about 10 kilometers to the east on Lac Larouche. Note: The price includes the use of their vehicle. Obviously the more canoes and paddlers you have the lower the “per person” price goes. A four paddlers/two canoe shuttle to Lac Barrage, for example, would cost $1350. / 4 = 340., not a huge price to pay for dealing with the biggest headache of non-loop canoe trips, the logistics of getting back to your vehicle. All this shuttle talk brings back memories of an early 1980’s trip down the Missinaibi. It began with a ride on the Sudbury-White River train from Sudbury, where we left our car. We got off the train just before Missanabie at the west end of Dog Lake’s Fifty Seven Bay. Then we did the Height of Land portage, and canoed down the Missinaibi to the Moose Factory Island campsite. One morning before dawn we paddled over to Moosonee and took the Polar Express back to Cochrane. While I did the Ontario Northland train with the canoe and gear down to North Bay, Max set off from Cochrane for Sudbury to get the car. He hitchhiked! At 2:00 a.m. as the train pulled into the North Bay station, there he was waiting. We loaded up the car and headed down to Toronto, coming into town at dawn, having started our day 24 hours before on James Bay. An epic shuttle! 2. The Coulonge R. from Lac Ward To The Ottawa R.
When we got to the Ottawa River we turned left and continued on down to Ottawa and the Rideau Canal Locks. The Canadian Canoe Routes site has a 2009 trip report by Robert Pavlis which covers the Coulonge from Lac Pomponne down to the Chutes Coulonge and has lots of excellent observations, especially about camp site possibilities. See here for the report. I only found it after the trip – it would have been good to have had a copy come along for the ride. 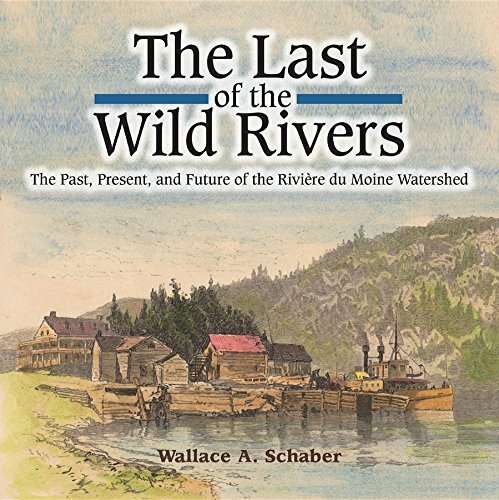 A book we read in the early spring after we had decided to do the Coulonge was an ebook version of Wallace Schaber’s The Last of the Wild Rivers: The Past, Present, and Future of the Rivière du Moine Watershed. While the main focus on the book is the Dumoine River, Schaber provides all sorts of historical background and personal reminiscences to make it an enjoyable read for anyone interested in the upper Ottawa Valley in general. Along the way, you also get the story on the origins of the famous canoe tripping company Black Feather and the canoe gear retail store Trailhead! The book added a bonus element to the seed-time part of this year’s canoe trip. Black Feather, the wilderness adventure company started by Schaber, has a massive list of offerings. [ I’m considering one of the their Nahanni trips in the next couple of summers.] It offers a Coulonge canoe trip – a nine-day one from Lac Pomponne to the Chutes Coulonge. (See here for details.) It would make a great introduction to wilderness canoeing for someone who is short on time and is willing to spend a bit of money. What they would get in return is a fantastic canoe trip where someone else takes care of all the details and experienced guides take them down a river they have done often before. They’ll know the story of the river and all the great campsites and places to play in the rapids. Esprit Whitewater (aka Esprit Rafting) does not just do shuttles up to various points on the river. Their website also has a number of organized Coulonge trip possibilities listed: a two-day, a four-day, and a ten-day one like the Black Feather one. (See here.) What you’d be getting is a trip guided by locals who are very knowledgeable and passionate about their rivers. For first-timers, a guided trip makes a lot of sense and would give them the opportunity to learn the camping and canoeing skills which will soon have them organizing their own increasingly ambitious trips.